Busy tableaux offer readers the opportunity to seek and find disparate characters and items that figure in Charles Dickens’ beloved tale. This book assumes familiarity with the story, and given the many adaptations clogging shelves and airwaves at Christmastime, it’s probably fairly safe in doing so. An aerial view of London with neighborhoods labeled will likely be off-putting to readers for whom Clerkenwell and Holborn are meaningless, but the challenge to pick out various itty-bitty Cratchits, a hovering ghost of Jacob Marley, and Scrooge himself requires no local knowledge. 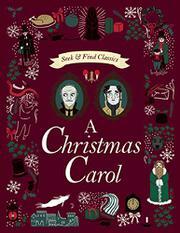 Subsequent scenes of picturesque London streets, 19th-century interiors, and, of course, the graveyard offer such seek-and-find delights as “a grinning grocer,” “a bowl of gruel,” and “Tiny Tim’s funeral.” Powell’s adapted narrative, such as it is, is an unvarnished summary: “The grandfather clock strikes one, / A strange specter appears in his room, / The Ghost shows Scrooge his past….” It is presented in a narrow band on the left of each double-page spread above 10 labeled items or characters to be found in the accompanying picture. Scrooge is present in every one, his emotion changing from setting to setting (“a grumpy Scrooge,” “a wistful Scrooge,” “a festive Scrooge,” and so on). Pigott’s flat, folk-art–inspired paintings are a good match for the work, presenting both Grandma Moses–esque detail ideal for the activity and a flat, staid look that evokes a period aesthetic.